This article looks at special considerations when using LED colour mixing fixtures, why they don’t always behave as you would expect and why photography (and photographers) can be hard work with your LED stage lighting. This is not a physics lesson – more of a lampie explanation in a muddy field at 2 in the morning. In our colour theory article, we looked at simple principles of reflected colour . Advances in coloured LED technology, interest in saving energy and our downright “techieness” has led to the increased use of LED colour mixing fixtures for stage lighting. This particular technology comes with it’s own set of issues around dimming and colour. If mixing Red, Green and Blue LED’s is supposed to create 16 million odd colours, why do you get some weird colour results from costumes and sets? More the point, why do I keep getting accosted by photographers and camerapersons (?!). Without boring you with endless graphs about spectrums, let’s look at the broad priniciple of seeing colour. A normal human eye can percieve light wavelengths of the visible light spectrum ( around 380nm to 740nm) that, as displayed on a spectral graph, creates a nice friendly looking curve. The CCD in a digital camera can detect visible colour ranges, but it’s spectral graph is a bit different. Digital cameras in particular can struggle with certain saturated colours, even with the “correct” white balance. In Colour Temperature, we looked at the levels that different parts of the light spectrum emitted by different light sources such as tungsten and daylight. These have an effect on the amount of colour that is reflected back at the eye or camera. How to control that was detailed in Colour Correction and colour temperature often seems to be the centre of a photographers universe. The spectrum of light colour bounced back is down to colour of both light source and target. Sometime these are in harmony, sometimes not. So, we have a 3 way equation. The spectrum emitted by the light source, the reflection from the target and the perception capabilities of the eye/camera. I don’t know much about making LED’s but for whatever reason, they can have a less “rounded” spectrum output than say a tungsten light source with a gel over it. This create “spikiness” in the spectrum graph. One particular blue wavelength is stronger that the other blues etc. 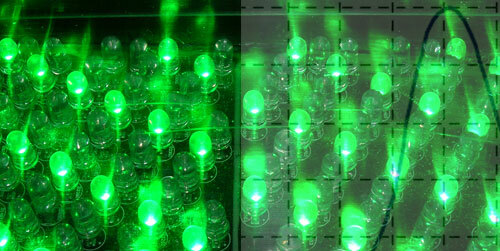 Green LED’s often have a higher spectrum output altogether, compared to Red or Blue ones. This can cause particular colours to appear to “zing” out or make sets and costumes unexpected shades of odd. The addition of Amber LED’s (RGBA) goes some way to smoothing out the spectrums for some colour mixes and manufacturers are producing improved LEDs. LED packages have their own colour spectrum graph, the cheaper ones are the worst offenders. Something to bear in mind when your Cheapo PARSplats are creating colour havoc and driving the snappers mad. What is the colour temperature of LED stage lights? This is asked by photographers a lot. They are happy knowing that Tungsten is 3200 K and Daylight is 5700 K and have equipment set up to deal with this. Of course, the actual colour spectrum emitted by any lighting fixture is a variable set of wavelengths of different strengths. This is true of LED fixtures, including “White” LED’s. Even setting a white balance with one LED state, doesn’t help much the minute you crossfade to something else. Manufacturers sometimes refer to the Colour Rendering Index (CRI), particularly with wider spectrum sources such as white LEDs. Though not without it’s own limitatons, the CRI could be thought of as an indicator of the amount of the spectrum a light source emits. A tungsten light source has a CRI of 100, while those horrible streets lamps that are no use for reading maps (Low Pressure Sodium) might have a CRI of less than 5. So, the actual colour temperature of LED stage lights is not particularly relevant. Individual LED’s have a spiky spectrum graph and colour mixing with cheap LED PAR Cans can create all kinds of chromatic weirdness. Add to that that fact that a digital camera is not as high spec as the human eye ,you might feel a bit sorry for your photographer. That’s before we even get to video cameras, PAL/NTSC and gamut. If stills photographers have to deal with the ghastly colours your rig is firing about all over the place, video cameras can go one better. Dimming tungsten lighting, the electrical waveform is chopped rapidly and the filament cools down to a lower intensity level while remaining lit. The dimming in discharge lamped moving heads is provided by the physical cutting down of light output using a mechanical shutters. Dimming LED’s using variable electrical currents is inefficient and isn’t good for the LED. For this reason, many LED lighting fixtures use techniques such as Pulse Width Modulation to control light output. This flashes the LED on and off at different speeds, creating a change in perceived brightness. As videos cameras use the the rapid capturing of still images to produce moving pictures, the possiblity of a conflict between the different cycles can cause strobing on camera. Most sophisticated (and expensive) LED systems have improved dimming cycles but again cheap imported LED fixtures can be a bit rough. Some of them even strobe to the naked eye!. A short term solution is to adjust the levels of the LED fixtures until the strobing is not so noticable on screen. Colours from light sources reflect from coloured surfaces. LEDs have spiky colour spectrums. Cheap LEDs are cheap for a reason. Photographers will always complain about your lighting. Don’t start a discussion about colour theory at 2 in the morning. Hey! Can anyone help me out – I’m looking at buying some LED PARs and I can either have 56s or 64s. I understand the difference between conventional 56s and 64s but I can’t seem to find a difference between the LED fixtures. Can anyone help me out please?